When it comes to BMX frames these days, there are a lot of factors that come down to geometry that can alter the way a BMX bike feels and rides. Want to have more balance on your nose? Get a steeper head tube angle. Want to spin better? Get a higher bottom bracket height. Want to manual better? Get a shorter chain stay length. Need something better for barspins? Get something with a taller standover height. What about tailwhips? Shorter standover heights will make it easier to get over the bike. Now days, a 75-degree head tube angle, 71-degree seat tube angle, 8.5″ standover height, 11.5″ bottom bracket height and 13.25″ chain stay length are pretty common geometries you will find on a frame. Sure, there might be a handful of frames that have similar (or the exact same) geometry, but what makes them different than the others? The “minor details” that are added on to a frame to give it an aesthetic touch, add strength or make for a cleaner fit when parts are installed. There are A LOT of frame options these days, so we decided to cruise around a handful of BMX brands websites to check out a few frames that have some details that make it stand out from other frames. Let’s take a look! The Wethepeople Scorpio features a handful of unique features that give it a distinct look along with some strength benefits. The seat stay bridge is definitely a unique feature. Hydroformed gussets on the top and down tubes add strength, but also give it a sleek look. Unique removable brake guides on the top tube. A handful of frames offer this one, but bullet tipped seat and chain stays at the dropout junction. The new Chris Harti signature “Hartbreaker” frame from Fit Bike Co. has a few features on this frame that aren’t all too common anymore, but we used to see more frames with the feature. Starting out, we have the laser etched Fit Bike Co. logo on the head tube and F-IT logos on the gussets and welded on brake cable guides. Welded on brake mounts. We don’t see that all too often anymore. This frame is definitely designed for the trails guys versus the street guys. Welded on brake cable guides and the through the seat tube brake cable guide. Two things we don’t see all too often anymore. You can find out more about the Hartbreaker frame RIGHT HERE. Here’s a frame that got some of the old school guys pretty stoked. FBM brought back their classic Angel of Death frame with more modern geometry and an overall much lighter weight version of the original. As you can see by the photo, this frame utilizes the wishobone on the seat stay and chain stay junctions. We don’t see both of those together all too often anymore even though it was much more popular back in the day. Always run brakes? Get the welded on brake mounts. Ride brakes sometimes? Get the removable brake mounts. Hate brakes? They have a completely brakeless version of the frame. Minor details like this that can appeal to every rider. Learn more about the Angel of Death frame RIGHT HERE. Alex Donnachie‘s signature ALVX frame from BSD has a few unique features that are ideal for you guys out there that like tight, technical riding and manuals. As you can see from the photo above and below, the chain stay bridge is VERY tight up next to the bottom bracket. That’s because this frame uses a 12.5″ – 13″ chain stay length. We’re pretty sure that’s the shortest rear end available on BMX frames right now, but we might be wrong. They also utilize the horizontal cut system that Flybikes uses on their frames as well. That small cut below the clamp allows from the frame to clamp to the seat post with less stress and torque. Small feature, but definitely works. You can find out more about the ALVX frame RIGHT HERE! While we’re on the topic of Fly Bikes, we might as well look at one their frames. The Stefan Lantschner signature Montaña frame, along with their full range of frames, all come with the same features but utilize different geometry. Above is a look at the Investment Cast dropouts, which are pretty common on BMX frames these days, with their removable chain tensioners. All of Fly’s frames use the “Easy Brake System” which allow you to remove your brake mounts from the frame without having to remove the brake arms first. It’s a nice touch for those of you who are always switching back and forth from brakes to brakeless. The Easy Brake System applies to the brake cable guides as well. There are gussets on this frame. No, you can’t see them, but they’re there. Fly Bikes use an offset thickness head tube and internal integrated gussets on their top and down tubes. You can learn more about that right here and see what it looks like when the frame is cut in half. The 3rd version of Simone Barraco’s signature Noster frame from Subrosa has a few nice aesthetic touches to make this frame look unique without adding too much to the price tag. The gussets on the top and down tubes both feature Subrosa logos. The seat stay bridge is a unique Subrosa logo that incorporates the peace sign. Appealing to Simone’s slightly hippie side. With grinding becoming so popular, having drop outs that don’t get in the way have been a big part of the evolution of BMX frames. Simone’s frame has drop outs that are shaped like a peg for a flush look on 34mm diameter pegs. Plus, the drop outs are heat-treated for extra strength to help prevent bending. Notice anything missing? The Noster III is completely brakeless. No mounts and no guides. Clean and simple. You can find out more about the Noster III frame RIGHT HERE! We will be the first to admit that the first time we saw the Haro Bikes Lineage frame at Interbike, we were questionable on if we liked the wrap around head tube gusset or not. Over time, it has grown on us and we like it more and more each time we see it. Something about it being so unique and old school just works. The Investment Cast drop outs feature the Haro logo’s CNC machined out. Looks good! 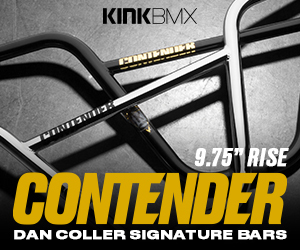 Earlier this year, Kink Bike Co. released Sean Sexton‘s signature SXTN frame that featured a few unique looking additions. Above is a look at the seat stay bridge that has a great look and also looks real strong. Something about that beefier design. It’s also rounded to give you more tire clearance since 2.40″ tires are all the rage. The chain stay is very simplistic and clean. They’ve extended the welded areas on the sides to make up for there being less material in the middle. The dropouts have a few different things going on. The CNC machined cutouts in the drop outs, the circle cut outs on the seat and chain stay caps and the integrated chain tensioner running through the drop outs. You can find out more about the SXTN frame RIGHT HERE! The Mick Bayzand signature Burma frame from Colony has more than just a flashy oil slick colorway. There are a handful of minor details on this that make it stand out from other frames. The gussets on the Burma frame have a unique shape and they also have the Colony logo laser etched into them for a clean look. The frame has unique gussets on the seat and chain stays that we don’t recall seeing on other frames. This little gusset adds a bunch of strength to a high stress point on the frame. You can find that gusset on the seat stay bridge as well. They have even added “Colony” embossed lettering to it. You can find out more about the Burma frame RIGHT HERE! The Jeff Wescott signature Comb frame from Mutiny Bikes has a handful of small details that give it a real aesthetically pleasing look. The top and down tube gussets both feature the Mutiny crossbones logos which you can see a similar one on the head tube sticker. The wishbone on the chain stay features the Mutiny crossbones logo as well. There’s a small Mutiny logo on the seat stay end cap by the dropouts. Small Mutiny logo on the seat post clamp! They tucked a handful of logos on this frame without making it look like it’s too much. Plus, can we take a second to appreciate this translucent gold color? You can find out more about the Comb frame RIGHT HERE! The Sunday Bikes Soundwave frame is one of those frames that is clearly designed for strength and to stand out from the crowd when looking at frames. Above is the 2015 version of the frame, but the photos below are from 2013 since they were the only detailed shots we could find. We’ll note any changes you can find from the 2015 and the one below. The Soundwave features a unique cable guide that “hides” the brake cable in the channel for a cleaner look. The chain stays on this frame are very unique. Sunday used boxed chain stays on this frame to help resist denting and give 2.40″ tires plenty of clearance. The drop outs are also 8mm thick and hollow giving them plenty of strength without adding weight. There’s also integrated chain tensioners in there. A lot going on in this photo. This frame also utilizes the Director wishbone on the chain stay which you can see in the full frame photo above. The Soundwave features their unique gusset on the down tube and their “wave” tubing on the top and down tubes to help resist denting. It also gives it a very distinct look. This is one frame you could easily pick out when comparing a bunch of unmarked frames lined up. You can see the wave tubing on the down tube and gusset better in this photo. The 2nd version of Alex Coleborn‘s signature Hangover frame from Total BMX is unique compared to a lot of frames because of its low slung design. A lot of frames have been moving toward 8.5″, 9″ and even 10″ stand over heights and this frame uses a 7.3″ standover height. This is definitely ideal for you technical guys who love tailwhips. You will also notice that the frame uses the integrated seat post clamp in the top tube which eliminates the external clamp that you find on most frames. The frame has that tight seat stay bridge similar to the ALVX frame we looked at earlier. That’s to accommodate for that SHORT 12.93”-13.2” chain stay length. There’s a unique seat stay bridge with “Total BMX” machined out of it. Looks good. The 2nd version of the Bermuda frame from Volume Bikes is not only available in a few flashy colors like Transluscent Gold, Translucent Blue, Flat Olive, Flat Black, E.D. Penny & ED Navy, but it has some minor details like the “VLM” logo on the top tube gusset. The Investment Cast drop outs are clean and small. They’re 7mm thick and heat-treated with an integrated chain tensioner. Doesn’t get much cleaner than that! With Investment Cast drop outs, it’s easy to do some extra detail on the dropouts that you normally couldn’t get with CNC machined or laser cut dropouts. The inside of the dropouts are given some extra detail to help reduce the weight without sacrificing strength. We had a few requests in the comments, so we figured we better add this one in! Not sure how we failed to mention this in the first place. Either way! The Terrible One Barcode is one of the legendary frames, like the STA below, that hasn’t seen a lot of changes looks wise over its existence and it’s still one of the most loved frames out there. With it’s double wishbone rear end, welded on stays, clean gussets on the top and down tubes. This is one of those frames you could see completely unstickered, in any color, and know exactly what it is. It’s safe to say that the STA (Stronger Than All) frame from Standard is one of the most recognizable frames in BMX history. This beast of a frame features the unique gusset between the top and down tubes and the pierced top and seat tube junction. The frame has been updated over the years to accommodate the change in trends, but the overall look hasn’t changed too much. A better look at the pierced top tube / seat tube junction and welded on brake mounts. We should also note that since Standard does all of their frames right here in the U.S.A in house, you can get this frame without the gusset up front and completely brakeless. So, that seems like a safe stopping point. This is just a small sample of the BMX frames that are available these days. As you can see, there are a lot of small details that can make a frame stand out from others even if they have the same geometry. What do you think about this? Let’s talk about it in the comments! Let us know!